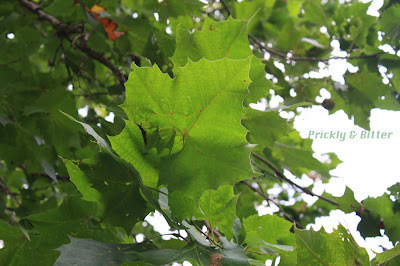 The American sycamore (just "sycamore" from here on out since I live in North America) is native to eastern North America and has quite an extensive range throughout the Carolinian forest (from Ontario south to Texas and Georgia and everywhere in between). 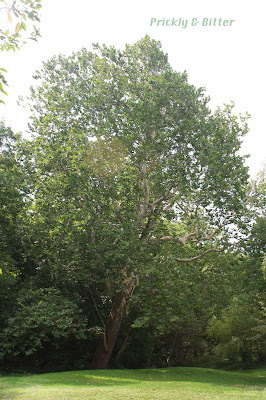 Depending on the environment, it can be an absolutely enormous tree, reaching heights of 40 or 50 meters (sycamores are some of the easiest trees to spot from the edge of a forest, especially during the winter, because they reach above the rest of the forest canopy) and diameters as large as 4 meters. The largest sycamore ever recorded was in 1770 recorded by the one and only George Washington near the junction of the Kanawha and Ohio rivers; he recorded in his journal the tree was approximately 14 meters in circumference! Go measure out a piece of string 14 meters in length and go wrap it around the biggest tree you can find. I bet your "incredibly large tree" will be tiny in comparison to your string! 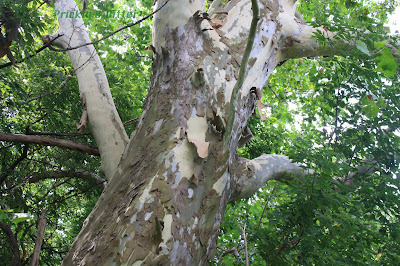 This tree, for obvious reasons since trees don't live forever, is no longer standing but it's not uncommon for a sycamore to be 6 or 7 meters in circumference if rooted in deep soil. 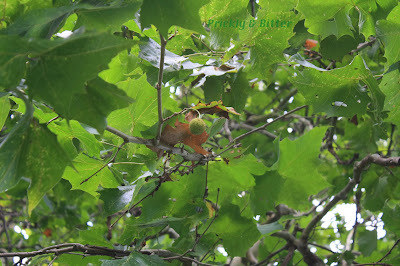 So what's so special about sycamores? Well, they're relatively unique trees in that they're riparian or riverbank species, and at the same time they have incredibly weak root systems. How do I know that, without ever having seen a root system of a sycamore? Well...look at the trees. 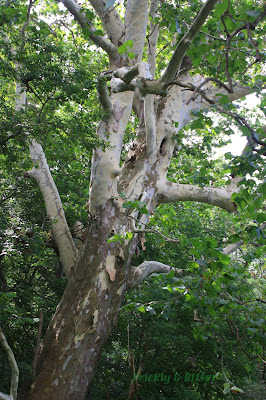 Next time you're walking along a stream or a river with sycamores growing, look at the shape of the trees. 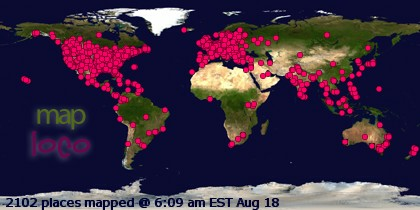 Chances are, none of them are straight up and down. This is because when the trees were young and growing along the bank of the river, the freeze-thaw (or extreme floods of the rainy season) cycles caused the damming of ice up against the trunk of the tree. The roots weren't strong enough to support the tree upright, so it started to lean the same direction that the ice was pushing. If you look at a mature sycamore, it still has the lean of the direction of the river or stream. Extreme flooding would do the same thing; it would wash away the soil near the base of the tree causing the trunk to shift, and lean the direction of water flow. 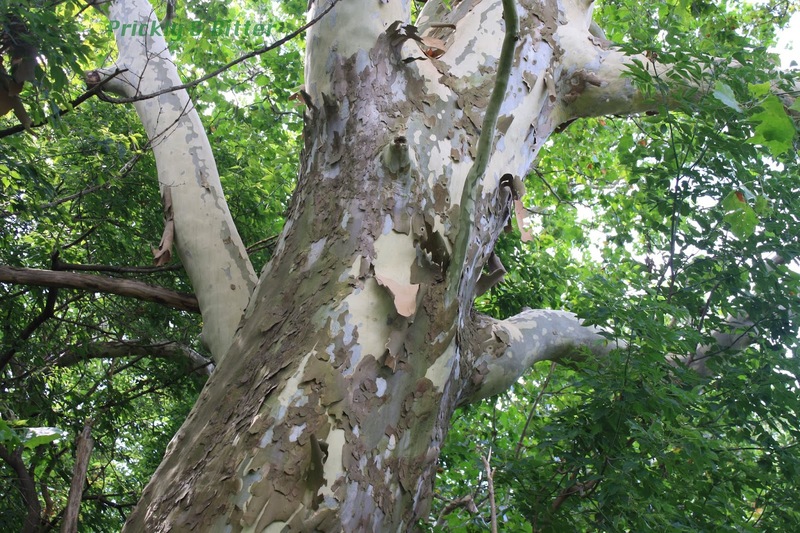 If you see a sycamore growing out all by itself in a big farm field and it leans, chances are the farmer has reclaimed the land where the river or stream used to be and put pipes to drain away the water instead. That lone sycamore is the only remnant of the forest that used to be present. 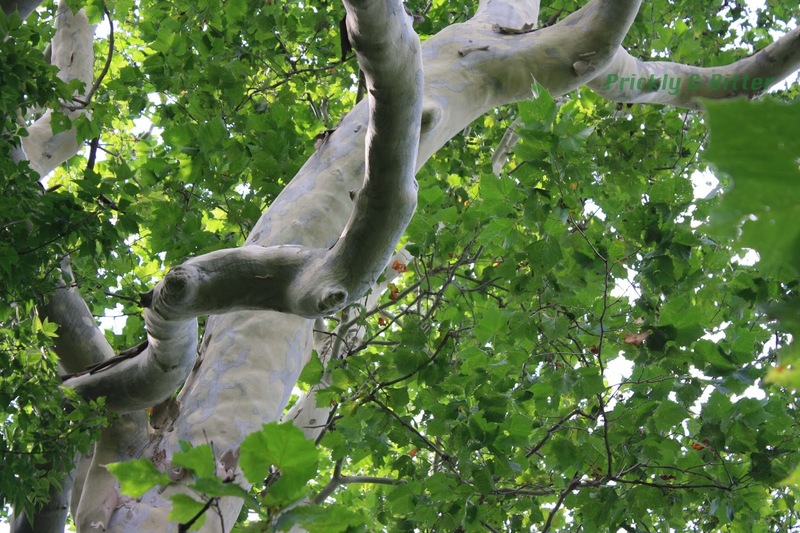 There are two main uses of sycamore trees today. The first is as an ornamental wood for a very specific purpose: in butcher blocks. Many wooden cutting boards are also made out of sycamore wood. It is strong and very durable, with very coarse grain that shows a nice pattern when stained and sealed. The coarse grain makes it very difficult to work with, but is still sometimes used in constructing furniture. The other main use of the tree is as a biofuel crop, since initially it grows very quickly and accumulates a lot of carbon. The wood of the tree can be burned in an oxygen-poor environment to make charcoal, and then burned again for fuel. Not necessarily the cleanest method of energy generation, but certainly better than burning coal (and charcoal could be burned in many of the pre-existing coal plants, providing there was enough charcoal to make it worthwhile! ).